Getting buyers to visit, buy and keep buying is the essence of marketing for websites selling things online. When people share your content with their friends, your campaigns gain far more reach at no additional cost. Selling online requires a specialised marketing mix – but the same principles can be applied to almost any website. This infographic reveals the key factors in marketing for e-commerce stores – and the relationships between them. The most important elements are nearer the top. In general, the elements higher in the graphic should be allocated more of your marketing effort and budget. The number of inter-relationships (indicated by arrows) is also interesting. This is a simplistic and subjective view – but it could be very helpful as a template for strategic planning. The priority of each element shifts during the business life-cycle. In particular, the initial launch of a new e-commerce brand (or any brand) requires significant publicity. Ideally PR and Publicity would receive the greatest share of your effort and budget at the launch stage, with SEO and Social Media tightly integrated alongside. Email becomes increasingly important over time as the size of your customer-base grows because email is an essential channel for maintaining engagement and bringing previous customers back to your online store. User experience becomes a lot less important if your site already provides an excellent user experience, but it can always be improved incrementally using techniques such as focus groups, A/B split and multi-variant testing. There are other, broader marketing and business considerations. For example, affiliates are conspicuous by their absence. Consider them all included within “Other” and I make no apology if you find that controversial in relation to affiliates. Marketing is changing. This is the mix needed to achieve maximum impact with minimum investment. Given huge, corporate budgets, many other big-budget channels become feasible. Outdoor and TV advertising are good examples of other channels that can be very powerful as part of a balanced marketing mix. However, ROI is far greater with effort and investment allocated as indicated in the infographic. Furthermore, the impact of big-budget campaigns in offline channels can be difficult to measure. If people can’t place an order then your online business will fail. If people hate using your website then they won’t come back and they certainly won’t recommend it to their friends. Without good content users will be unable to make the decision to buy. Content sells your business and your products. The best forms of online content are copy, images and video. (Images are more engaging than copy and video is the most engaging form of content). Search campaigns include SEO, PPC and re-marketing. Without good, unique and informative content, customers are unlikely to find your website using search engines. (SEO) is the most targeted and powerful way to drive online sales. PPC is another powerful search channel that requires keyword-rich copy in order to be cost-effective. Social media campaigns rely heavily on good content too. That content is most effective when it exists on your website to support your campaigns to drive people to the website. PR and publicity should create content elsewhere and if your strategy is properly integrated then that will support your SEO and social media campaigns. If you have a website it must exist for a reason: it has goals and in order to meet those goals you need a strategy. Every business should have a website and every business needs a strategy to drive sales using online channels. Hopefully it is clear that the elements of the e-commerce marketing mix are inter-related. You need an integrated, holistic marketing strategy – spanning online and offline campaigns and closely aligned with your overall business strategy. 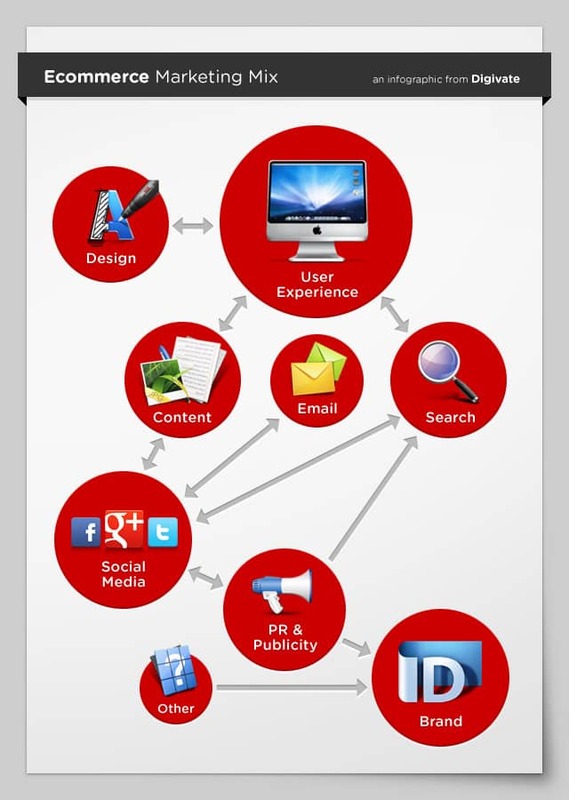 Brand and design must be driven by User Experience. No matter how cool your design and no matter how strong your brand, if it is difficult and unpleasant for people to interact with you and buy from you then your business is doomed. In a very real sense, your brand is now embodied by your online presence – whether you like it or not. Here your 5 most important marketing activities are revealed, in order of priority – providing not just a framework but actionable strategic intelligence for e-commerce brands. (I expect social media to overtake email in the not-to-distant future). Welcome to your new marketing mix. If you need help building and implementing your new strategy, just let me know.